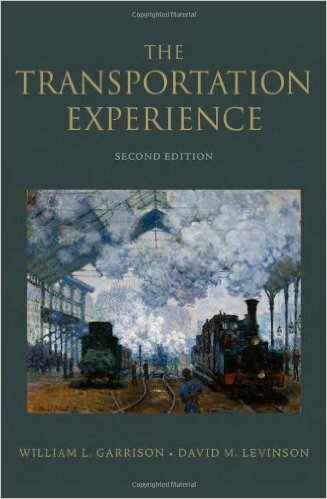 The Transportation Experience offers unique breadth of scholarship in describing the history of US transportation. Its erudition and insightful links with other aspects of societal evolution are improbably combined with an informal, colloquial style that makes most of the book widely accessible. However, a curious omission emerges as the narrative reaches the modern era. The senior author acknowledges in his afterword that he deliberately minimizes engagement with politically controversial subjects. The first paragraph already demonstrates the book’s flair for dramatic impact. It describes actions of Thomas Jefferson, head of the US Patent Office, on August 26, 1791. Four applicants sought patents for complete steamboat designs. “Solomonically dividing the patent spoils kept any from dominating the market and developing a large enough market to succeed” (3). The multilevel insights from this anecdote reveal that Jefferson, the brilliant inventor, naturalist, and intellectual and political leader, made a decision that impeded people and progress he wanted to encourage. The primary source of such erudition is the senior author, William L. Garrison, a professor emeritus at the University of California, Berkeley. His peripatetic studies over more than a half-century (Garrison was born in 1924) complement the book’s detailed account of transportation with insights from tangential fields like history, engineering, economics, and social psychology. This second edition is completely restructured, extensively rewritten, and augmented in comparison with the first edition of 2005. In contrast to the first edition’s prefatory discussions, this book has no preface, introduction, or discrete acknowledgments. It is far more tightly organized. After a detailed table of contents, the treatment is divided into parts, thirty-five numbered sections that run through five overlapping “waves” of chronological developments, and “phases of the life cycle,” that the authors initially describe as brainstorming sessions. Grounded as it is in deep scholarship, the colloquial style of the book probably reflects contributions by the junior author, David Levinson, a civil engineer and professor at the University of Minnesota who has special interest in transportation. But addressing readers more personally also appears congenial to Garrison. He closes by offering an invitation to readers to “have fun imagining alternative development pathways that will exchange today’s problems, both obvious and obscure, for new ones” (p. 524). engine, the steamboat, and inland waterways; “Design by Design: The Birth of the Railway”; and “Incentivizing Investment: Roads through the Turnpike Era.” Subsequent waves deal not only with new subjects like maritime transport, including trading companies, ports, cargo and passenger vessels, and biographical detail on the great marine engineers, Marc and Isambard Brunel. They update developments in earlier transportation modes like railroads (Wave 2, 1844–1896) with topics as diverse as “Trial and Error,” “Learning about Freight Rate-Making,” “Cornelius Vanderbilt,” and “Comments by Social Critics.” Waves 3, 4, and 5 encompass the periods 1890–1950, 1939–1991, and “Modern Times,” respectively. The waves focus on but are not limited to their time period. Events are often placed in historical perspective by chronological profiles extending to the present. Many of the book’s figures and tables qualify as what l call leveraged illustrations. Such illustrations compress important insights and in-depth research into simple and eas- ily understandable figures. For example, Wave 2 includes a plot of total US railroad route kilometers from 1830 to 2010, peaking in 1920. Subsequent declines in route kilometers have an inflection point marking accelerated losses after 1970. Most other advanced nations experienced losses but none as great as this country. “Life cycle” discussions clarify factors affecting transportation and related fields. Phase 1 of the life cycle discusses inventing and innovations. Phase 2 introduces the concept of the “magic bullet,” which refers to innovations that make possible reductions in cost, and often make gains in convenience and accessibility. Henry Ford’s assembly line is a classic example. Impactful generalizations allow readers to independently discern nontransportation as well as transportation applications. For example, I identified the supermarket, Amazon, and Ebay as non-transportation magic bullets. Phase 3 of the life cycle, titled “Aging in Place, Aging sans Grace,” describes a central problem for transportation. “As systems transition from innovation through growth to maturity, the administration of the systems transitions from entrepreneurs and engineers to managers. Organizations become more and more risk averse; taking chances tends to be punished.” Section 18 includes a summary of leading theories and strategies for coping with the problem. Section 24 provides a brief discussion of theoretical topics such as temporal and spatial dynamics, the network design problem (NDP), “Macro-Economics vs. Life Cycle Economics,” queuing models, metacycles, and historic path dependence. Section 26, “Meta-cycles,” which closes Wave 4, deals with capital, cyclicity, and the new role of innovation in the production function. “Wave Five: Modern Times” faced a challenge because of difficulty in addressing the vast literature and complex controversies over environmental change and energy in limited space. A good opening of this topic is provided by reference to George Perkins Marsh’s pioneering and influential book Man and Nature (1864), which warned Americans about abuse of the natural environment (the date of its first edition is erroneously cited as 1850). The ensuing treatment provides basic data such as energy consumption and use by auto, air, and rail transportation after World War II, but this section largely ignores a huge rhinoceros in the living room: government policies and sociopolitical issues. The great strengths of the book are already suggested in its first paragraph. Heading these is its formidable scholarship in transportation history. Next, wide-ranging technologies, evolutions, and human responses encountered in the development of transportation systems are described with an irreverently colorful and informal writing style. The authors have the rare gift of using detail to clarify and enliven rather than to complicate and obscure generic concepts like “disjoint incrementalism.” Disjoint incrementalism refers to improvements or expansion of technology in one area that ignores possible adverse effects on others. It is illustrated by truckers’ adoption of high-pressure radial tires that disproportionately damage roads. No other book offers as great a wealth of historic detail, presented in vital and candid ways. Consistent clarity in explaining terms and concepts while the narrative builds a detailed framework of knowledge makes the book highly recommendable for non- specialists and beginning students as well as a basic historical reference for professional practitioners and academic researchers. The critical role of government for good or ill is hard to overestimate. Excessive regulation helped undermine the United States’ passenger rail system (Gallamore and Meyer 2014). The Clean Air Act Amendments (1970 and later) were effective in reducing air pollution but had unintended adverse effects on urban areas’ transportation planning systems (Garrett and Wachs 1996). Uncoordinated proliferation of permitting authorities in response to environmental concern in the 1970s is described by Manheim (2009) as a key factor in delays and increases in the cost of transportation and other major construction projects. The Chrysler building, a revered jewel in New York City, was completed in twenty months from 1928 to 1930. Contrast this with Boston’s scandal-ridden Big Dig. Permitting began in 1982, final approval was received nine years later, and highway I93 was fully opened only in 2005. The book by Garrison and Levinson can be warmly recommended as a mine of information on US and early UK transportation development in a broadly based historical framework. The twenty-seven pages of references provide documentation of the book’s data. However, they do not provide balanced coverage, leaving out reference to authoritative and influential transportation authorities like William R. Black and John R. Meyer. Finally, the book does not provide adequate treatment of contemporary transportation problems or foreign experience. Black, William R. 2003. Transportation: A Geographic Analysis. New York: Guilford Press. Gallamore, Robert E., and John R. Meyer. 2014. American Railroads: Decline and Renaissance in the Twentieth Century. Cambridge, MA: Harvard University Press. Garrett, Mark, and Martin Wachs. 1996. Transportation Planning on Trial: The Clean Air Act and Travel Forecasting (Metropolis & Region). Thousand Oaks, CA: Sage. Manheim, Frank T. 2009. The Conflict over Environmental Regulation in the United States: Origins, Outcomes, and Comparison with the EU and Other Regions. New York: Springer. Rietveld, Peter, and Roger Stough, eds. 2007. Institutions and Sustainable Transport: Regulatory Reform in Advanced Economies. Cheltenham, UK: Edward Elgar.